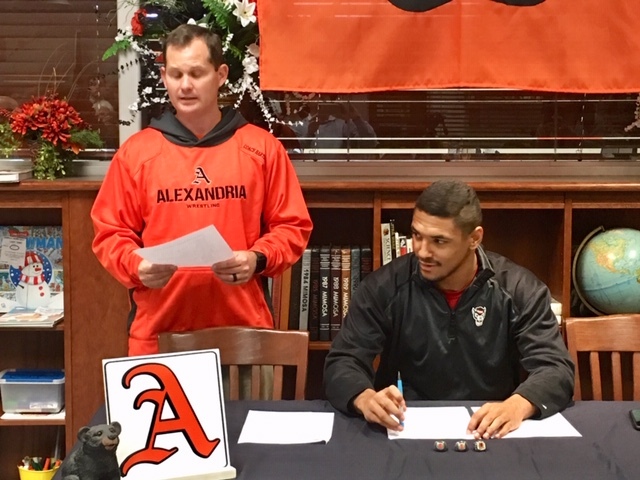 Alexandria wrestler Christian Knop listens as Valley Cubs coach Frank Hartzog reads Knop’s list of accomplishments during the senior’s signing ceremony Thursday. With all he’s accomplished you wonder what drives him now. Plenty. “What drives me now is pretty much the same thing that has always driven me – the want and desire to be the best,” the Valley Cubs senior said. “I told myself from Day One of wrestling I can do this, I can be the best, you just got to put your mind to it. You can’t be big headed; no matter how good you get, no matter how much progress you make, you still have the ability to become better. Knop fulfilled a lifetime dream Thursday when he signed and returned his NLI to anxious North Carolina State coaches. But not even that milestone, that might for some signal the end of a journey, has slowed his drive. And it’s that work ethic, Valley Cubs coach Frank Hartzog said, that has made Knop the wrestler he is today. Knop is 164-0 during his current run of state titles (250-32 all-time) and opens his senior season Tuesday at the Moody Duals. He hasn’t given up a takedown in two years and allowed only six points each of the last two seasons – when he has allowed his opponent up in order to score another takedown. 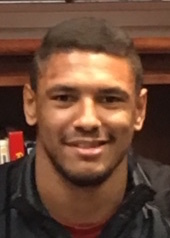 He needs 38 wins to break Weaver six-time state champion Michael Sutton’s state record for consecutive victories and 27 to break the county wins record held by Oxford’s Jordan Simpson (2009-13). If he runs the table again this season he will become the first wrestler in state history with four straight undefeated state championship seasons. “I think you always dream of a kid being that successful, but how often does it happen,” Hartzog said. “It’s impossible without somebody who has that type of work ethic; that’s not normal. Most super athletes are super driven, they’re not what most people would consider normal, just above and beyond in everything they do and that’s Christian. Knop is part of an N.C. State recruiting class that is expected to be one of the top three in the country; it was No. 3 last year, No. 1 in 2016. He has a chance to break into the Wolfpack’s lineup as a freshman as his expected 197 slot will be occupied this season by a redshirt senior who served as Knop’s host on his official visit, but he’ll still have to earn it. The most significant wrestling signing in Calhoun County history wasn’t without a little drama, though. Knop was expected to sign with the Wolfpack on Wednesday, but had a little trouble procuring his letter from school officials. The N.C. State coaches were a little worried late Wednesday night when the paperwork hadn’t arrived and texted him for an update saying he was an important element of the signing class, but Knop assured them his commitment was solid and once he got it sent on the paperwork first thing Thursday.